Preheat the oven to 200C. Place the garlic onto a tray and drizzle with a spot of oil and some salt. Roast for 30 minutes then leave to cool until you can handle it. Squeeze out the garlic and chop finely until it becomes a puree. Heat a griddle pan until it’s very hot. Slice the aubergines in half lengthways and season, then griddle for 5 mins, turning occasionally, until soft - the skin will remain firm, but the flesh will soften. Lift the aubergines off the grill and leave until cool enough to handle. Tip onto a board and chop the aubergine with the garlic until you get a thick pulp. Transfer into a bowl and mash with a fork. Beat in the lemon . Add the yogurt and chopped mint and season. Serve while still warm. 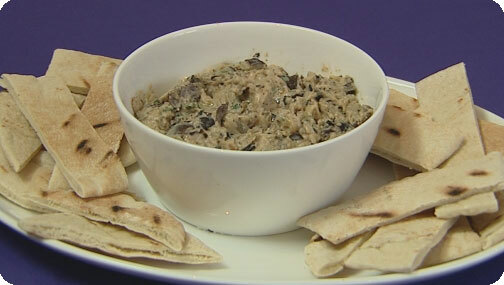 Toast the Pitta bread on the griddle pan, cut into strips and serve with the warm dip.